Copilot by Wildwest guns of Anchorage Alaska. Caliber 45/70. 1st picture is the Copilot broke down for storage. This is done by turning the thumb screw under the mag tube until the mag tube comes away from the barrel. 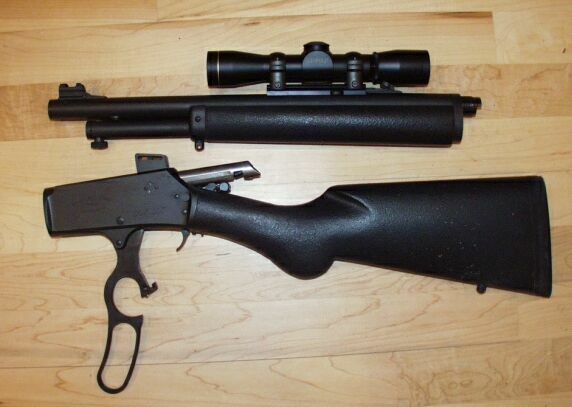 Pull the mag tube forward toward the front of the barrel until it stops. Then open the lever to its full downward position. Grasp the fore stock and the but stock and twist. The Copilot was designed as a bush gun for bush pilots and guides in Alaska to deal with the threat of grizzlies. easily stored under the seat or in a back pack. Second picture is the Copilot assembled. 3rd picture is a bear I shot with it. 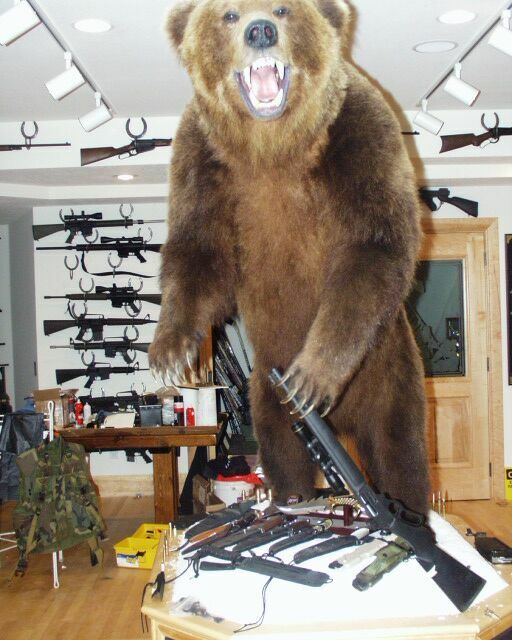 I had to show you the bear I shot with the Copilot. An 80-100yrd one shot kill. Shot it on the Kamkachta peninsula(or something like that, if you played Risk you will know where I am talking about).It is in far eastern Russia, in Asia. Shot it right after the wall went down. Shot it in the spring,so it did not weigh as much but was 11' tall. We rode around on sleds behind our guides who drove the snowmobiles. We arrived by helicopter 3hrs from Petropelovsk(again something like that) The tops of the tents were dug down so that the top of the tent was even with the snow. About 9-10 ft. I did this for about 3 grand I hear now people are spending upward of 10 grand for the same trip and having allot of problems.